The poster hanging in Room 252 of Ecole secondaire publique De la Salle reads: "Success in Music. Success in Life. It's not a Coincidence." Beneath it is an image of noted leaders from diverse fields such as politics, medicine, engineering and law, each posing with the instruments they played in their youth. You won't find Dantes Rameau, BMus '05, among the luminaries in that photo, but for the dozens of current De La Salle students in Ottawa who had the chance to meet and hear from one of their high school's most accomplished alumni on May 7, he could very well serve as the ultimate poster child for how to translate an early passion for music into a burgeoning career whose reach extends far beyond North America's radio stations and concert halls. The poster hanging in Room 252 of Ecole secondaire publique De la Salle reads: “Success in Music. Success in Life. It’s not a Coincidence.” Beneath it is an image of noted leaders from diverse fields such as politics, medicine, engineering and law, each posing with the instruments they played in their youth. You won’t find Dantes Rameau, BMus ’05, among the luminaries in that photo, but for the dozens of current De La Salle students in Ottawa who had the chance to meet and hear from one of their high school’s most accomplished alumni on May 7, he could very well serve as the ultimate poster child for how to translate an early passion for music into a burgeoning career whose reach extends far beyond North America’s radio stations and concert halls. “He is an inspiration to our students,” said De La Salle music professor Johanne Leroux, BMus’88, who counts Rameau among the hundreds of students she has taught at the school, which has a heavy focus on the arts. Best known as co-founder of the not-for-profit and much-lauded Atlanta Music Project, Rameau was in Ottawa as part of a three-day visit to Canada sponsored by the McGill Alumni Association, which culminated back in Montreal on May 8, with him receiving the James G. Wright Award, presented annually to a young alumnus who has demonstrated an exemplary commitment to service and made a difference in his or her community. The Atlanta Music Project, which Rameau started in 2010, provides free orchestral music lessons to youngsters from Atlanta’s most impoverished neighbourhoods, many of whom would otherwise not aspire to graduate from high school, let alone ever play a tune on a clarinet or French horn. Starting out in 2010 with seven students and a $30,000 grant from the Coca Cola company, Rameau has raised an additional $1 million in philanthropic support for his organization in the past four years and grown the program to 110 students. He expects to triple that number within three years. Rameau’s accomplishments have not gone unnoticed; last year, he was named to Ebony Magazine’s Power 100, a list of the most influential African Americans in the United States that also happened to include the likes of President Barack Obama, Oprah Winfrey and Magic Johnson. But far removed from hobnobbing with A-list celebrities, as he did last fall at Ebony’s gala event at New York’s Lincoln Center, Rameau seemed equally at home – or should we say, back at home – as he took to the stage in his old high school auditorium and addressed about 300 seniors. After taking students through his own inauspicious beginnings in music – he revealed that he detested the piano lessons his parents signed him up for when he was six years old – he described in detail his journey from aspiring high school bassoonist in Ottawa through to his education at McGill, Yale and Carnegie Mellon universities. 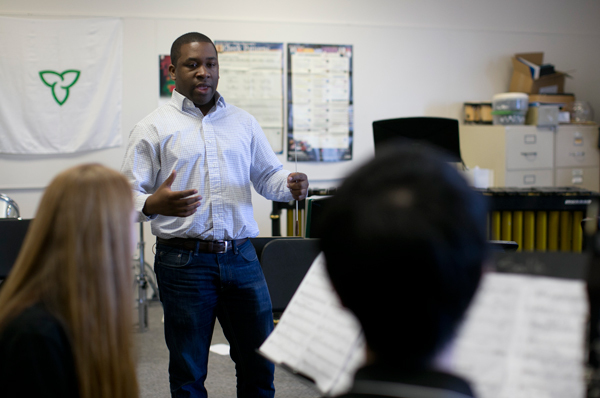 His studies culminated in 2009 when he was part of the inaugural group of El Sistema Fellows at the New England Conservatory of Music, a one-year program inspired by Venezuela’s now 40-year-old initiative that brings classical music to impoverished communities. Among his advice to today’s budding arts students: forge connections with individual professors; stay busy, even during the idle summer months; and make sure to socialize with non-artists as much as you can – they will likely be the ones who will pay your bills. And drawing from his own experiences, he reminded students that it was never too early to learn about grant writing. Rameau later led two music workshops with smaller groups of students. Among them was fellow bassoonist Samuel Rouleau, a Grade 12 student who is set to attend the Schulich School of Music in the fall.